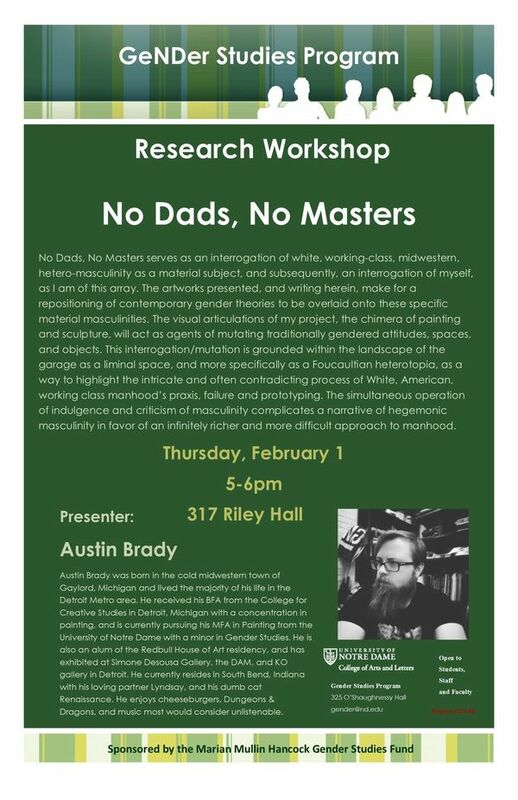 No Dads, No Masters serves as an interrogation of white, working-class, midwestern, hetero-masculinity as a material subject, and subsequently, an interrogation of myself, as I am of this array. The artworks presented, and writing herein, make for a repositioning of contemporary gender theories to be overlaid onto these specific material masculinities. The visual articulations of my project, the chimera of painting and sculpture, will act as agents of mutating traditionally gendered attitudes, spaces, and objects. This interrogation/mutation is grounded within the landscape of the garage as a liminal space, and more specifically as a Foucaultian heterotopia, as a way to highlight the intricate and often contradicting process of White, American, working class manhood’s praxis, failure and prototyping. The simultaneous operation of indulgence and criticism of masculinity complicates a narrative of hegemonic masculinity in favor of an infinitely richer and more difficult approach to manhood. Austin Brady was born in the cold midwestern town of Gaylord, Michigan and lived the majority of his life in the Detroit Metro area. He received his BFA from the College for Creative Studies in Detroit, Michigan with a concentration in painting, and is currently pursuing his MFA in Painting from the University of Notre Dame with a minor in Gender Studies. He is also an alum of the Redbull House of Art residency, and has exhibited at Simone Desousa Gallery, the DAM, and KO gallery in Detroit. He currently resides in South Bend, Indiana with his loving partner Lyndsay, and his dumb cat Renaissance. He enjoys cheeseburgers, Dungeons & Dragons, and music most would consider unlistenable.